Here is a GREAT way to honor your Cary High student athlete! 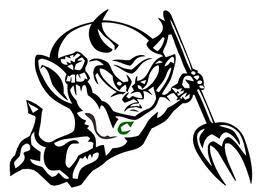 Parents can purchase a PERSONALIZED painted Imp with your student athlete’s name, sport and number on the walkway leading around CHS athletic areas! Each painted Imp is $50 and your payment goes directly to the athleteic team account of your choice. The Imp will remain on site from September 2017 to June 2018. 3) Send the info to Ken Kinsey through regular mail, post date will be used to determine order of receipt. Location choices include: Cooper Field Stadium from bleachers to field house, Gym entrance (either side) and area on/near baseball/softball fields. All spots are on a first come first serve basis. Seniors will be given priority assignments through September 5, 2017. There are only a limited number of spots available. Make checks payable to CHS Imp Club. Please be sure to designate the sport(s) that you would like your $50 to go to. If you have any questions or you would like to help with painting please contact Ken Kinsey @ (919) 523-5400 or email @ . Note that checks will be returned if spots sell out.